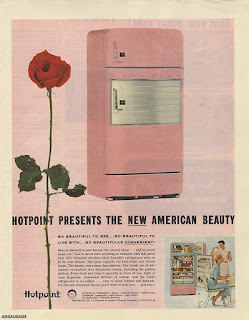 Today, we might not give a thought to giving flowers to our appliances [even for Valentine's Day], but obviously a more genteel spirit was at work in 1957. The humble, hardworking refrigerator—which the manufacturer boasted featured a 'lavish' use of aluminum—was deemed worthy of a long-stemmed rose. Does This Come in Harvest Orange? But Where Do You Put the Skeletons?